If you are an owner of prized goat herd, you have probably faced the difficult challenge of finding quality forage on a consistent basis. It is not always easy to keep the digestive system of your livestock properly functioning, while also meeting a large percentage of your animal’s daily nutrient requirements at a reasonable cost. Chaffhaye provides a solution as a superior alternative to baled hay and processed feeds for your goats. Chaffhaye Alfalfa provides the goat owner with exceptional versatility in crafting a ration that closely meets the desired nutritional requirement of each animal. If achieving optimal milk and meat production is the aim of the feeding program, the ration may be tailored in favor of Chaffhaye Alfalfa, a nutrient-rich forage product. Conversely, if animal maintenance is the aim, the ration can be shifted to incorporate a grass forage to compliment the benefits of Chaffhaye Alfalfa. The beneficial bacteria work in to make Chaffhaye a great forage for goats. The beneficial bacteria in the Chaffhaye bag essentially perform the same function as the bacteria in the digestive system of goats. They break the forage down to a form that can be digested by the animal. This “predigestion” means when the animal eats Chaffhaye, it can utilize more of the nutrition. Why pay for feed that is going to end up on the ground as manure. How an animal nutritionally utilizes their feed is just as important as what is in that feed. A feed can have all the nutrition in the world but if the animal can not absorb that nutrition it is lost in manure. An animal’s ability to absorb a feed is known as their “biological response” to the feed. 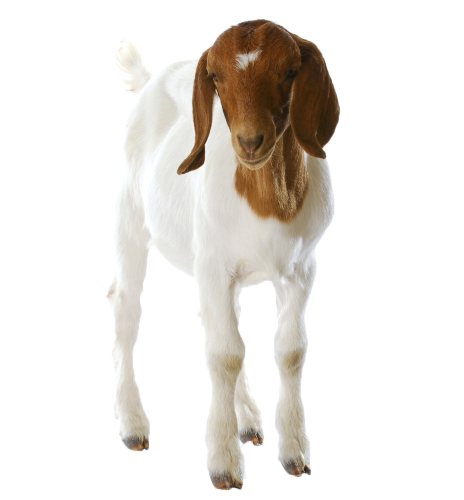 With Chaffhaye your goat will achieve one of the highest possible biological responses. Chaffhaye Alfalfa provides the animal owner with exceptional versatility in crafting a ration that closely meets the desired nutritional requirement of each animal. If achieving optimal milk and meat production is the aim of the feeding program, the ration may be tailored in favor of Chaffhaye Alfalfa, a nutrient-rich forage product. Conversely, if animal maintenance is the aim, the ration can be shifted to incorporate a grass forage to complement the benefits of Chaffhaye Alfalfa. Chaffhaye is designed to meet the forage portion of your animal’s diet. Depending on such factors as age, breed, workload, available pasture, and whether you are feeding Chaffhaye Alfalfa solely or in conjunction with another forage and/or grain, an energy and/or vitamin and mineral supplement may be needed. Consult a Chaffhaye representative or your animal nutritionist for further information. After observing your animal for a period of time on Chaffhaye, you may want to increase or decrease by up to 10% to obtain the desired overall body condition and appearance. Feed changes should be made gradually over a period of 7 to 14 days. Changes in the rate of feeding should not exceed 2 pounds per day.